Technicality: Extremely technical, containing steep, exposed scrambling, difficult route finding and abseiling. 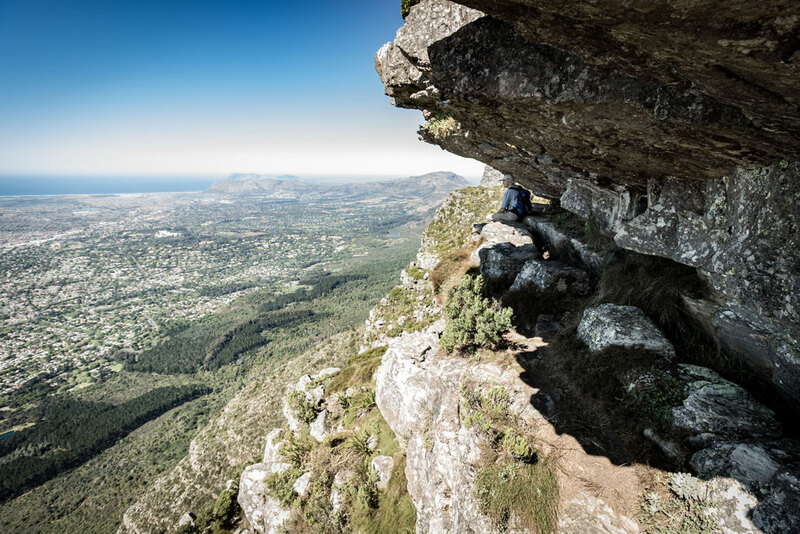 This route contains multiple sections of very exposed scrambling and abseiling where a mistake will result in very serious injury or quite possibly death. 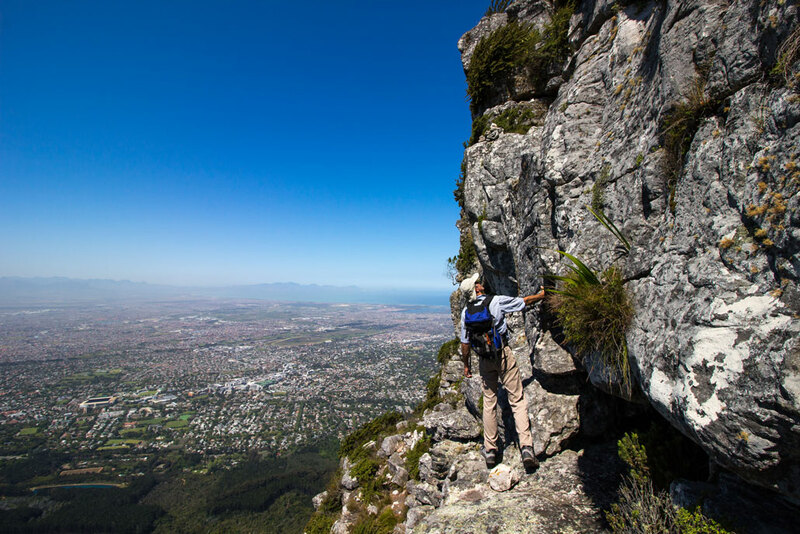 It should only be attempted by very experienced hikers that are comfortable with heights, scrambling/rock climbing and know how to abseil. Extreme care needs to be taken. 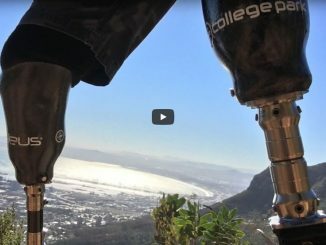 On 18 September 2017, Hilton Davies and Don Hartley traversed the iconic Cape Town skyline, starting at Bantry Bay and ending in Rosebank, at the Liesbeeck River. 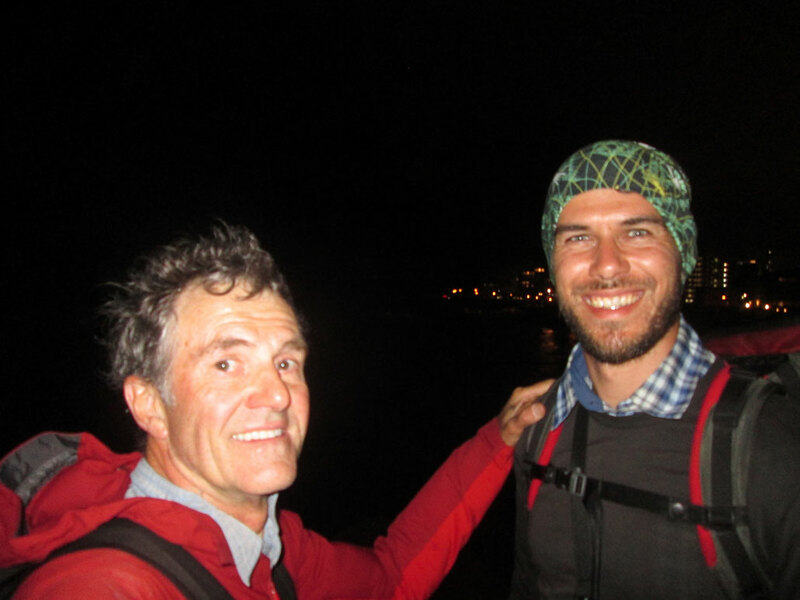 A few weeks later, I had the privilege of doing the same route with Hilton, but from east to west, starting in Rosebank, at the Liesbeeck River and finishing in Bantry Bay. Hilton is better known for his rock climbing exploits, having done hard and scary first ascents, both locally and abroad. 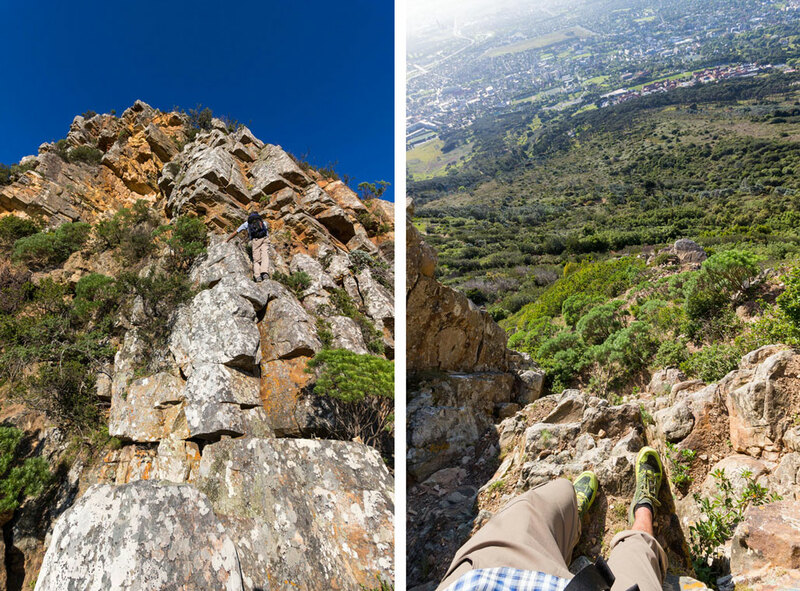 So, when the idea of traversing the Cape Town skyline came into his mind, climbing was a natural part of the puzzle. The idea with the East-West Traverse was to do the same route without any strict rock climbing, as well as following the course of the sun to maximise on daylight hours. 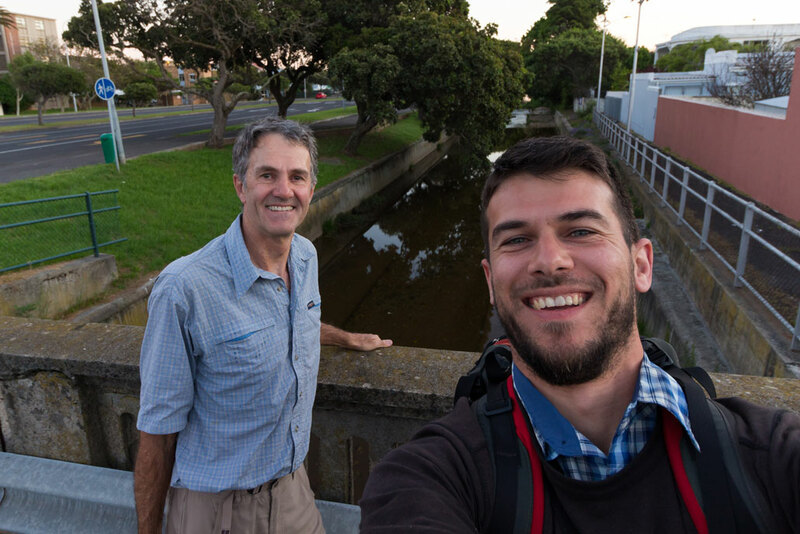 We set off at 06:20 from Alma Road, where it crosses the Liesbeeck River in Rosebank. Spirits were high, legs were fresh and we had a long day ahead of us. 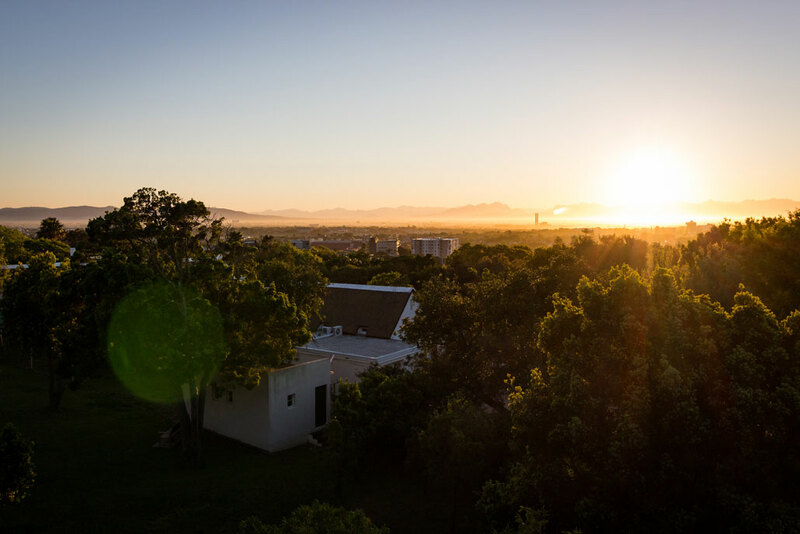 It was a perfect morning, with the first rays of sunlight painting the mountain with hues of pink and gold. By 07:30 it was already about 26°C. We took it easy up the hills and made sure we stayed hydrated. 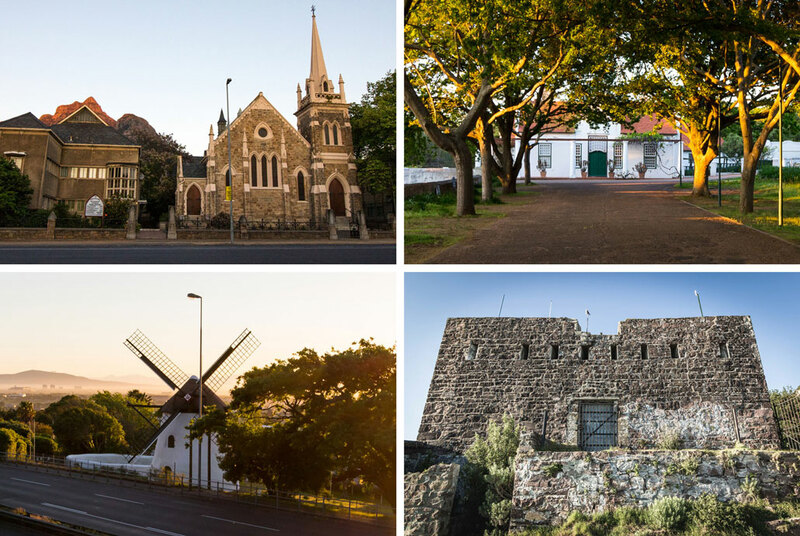 The path from Rosebank, up to the mountain, takes one past a couple of beautiful old buildings and historical sites, such the as the Rosebank Methodist Church, Welgelegen, Mostert’s Mill, Rhodes Memorial and the King’s Blockhouse higher up on the slopes of Devil’s Peak. 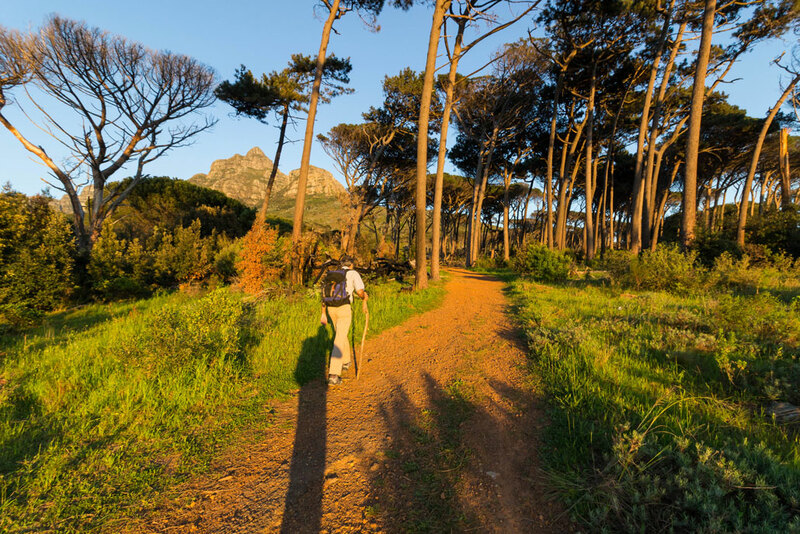 After crossing the M3 via the bridge next to Mostert’s Mill, one walks through a patch of pine trees – this is a known hot-spot for muggers, so pay attention and preferably hike in a group. The trail takes a very direct line up the ridge, with only a few doglegs where the trail crosses contour paths. This all adds to the aesthetics of the route by keeping it as close to the actual skyline as possible. 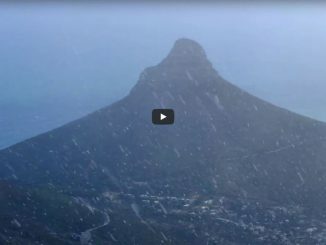 From the King’s Blockhouse we followed Mowbray Ridge, across the exposed, rocky knife-edge, over Minor Peak and up to the summit of Devil’s Peak via the Direct Route as described in Tony Lourens’ Table Mountain Classics. 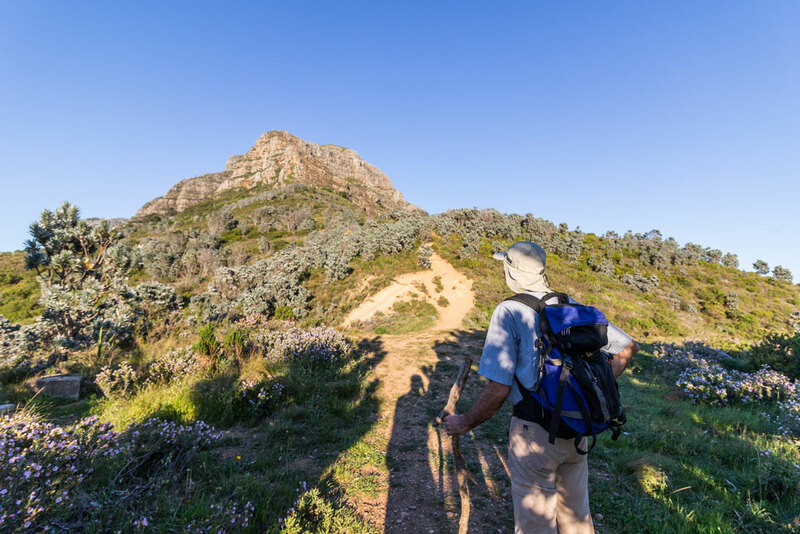 We took a wrong turn on Mowbray Ridge (first time and not paying attention…), which resulted in us scrambling up some unnecessarily exposed terrain. The view from the top of Mowbray ridge was stunning! It was about as perfect a day as anyone could hope for. From the top of Mowbray Ridge, we crossed over the spectacularly exposed “Knife-Edge” ridge, which connects Mowbray Ridge and Minor Peak. 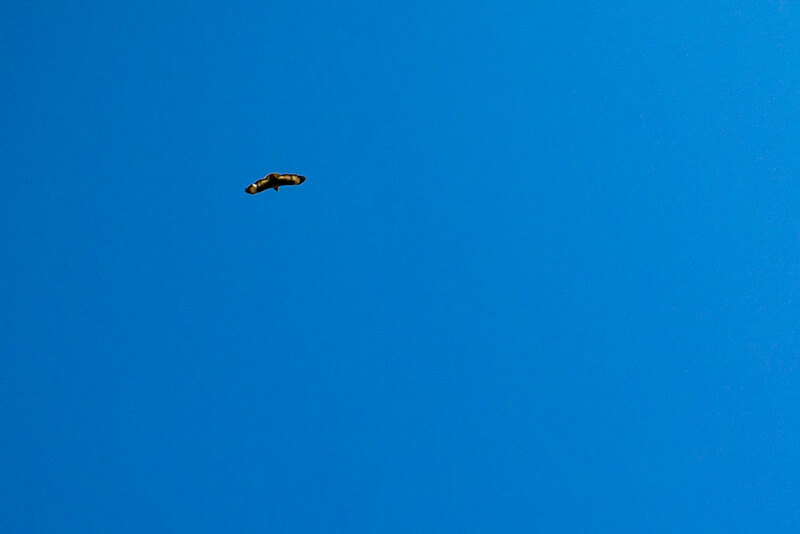 While we sat and had a snack on the summit of Devil’s Peak, we had the privilege of being visited by a pair of Black Eagles, casually soaring on the warm updrafts of the sunny morning. 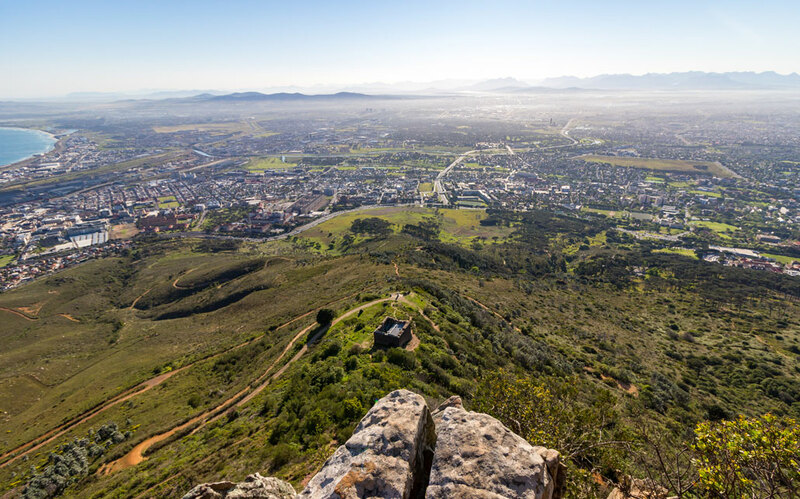 Panoramic views from the top of Devil’s Peak. 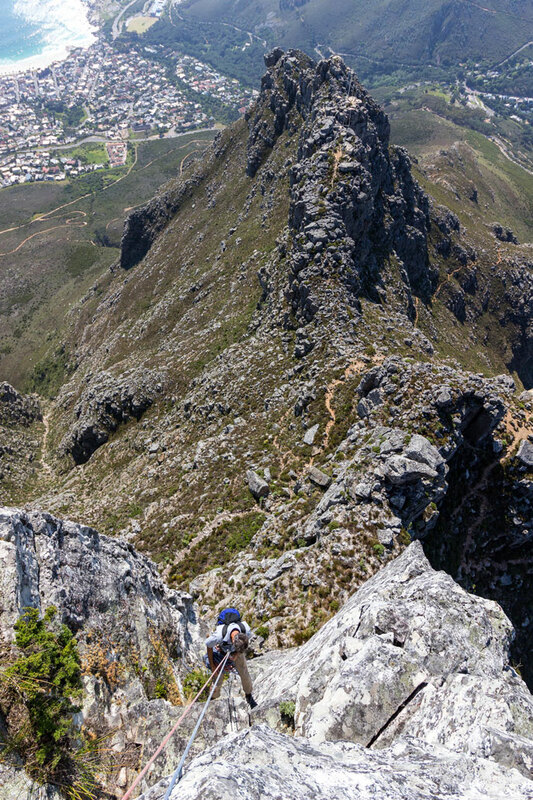 From the summit of Devil’s Peak, we descended and crossed over the saddle between Devil’s Peak and Table Mountain. 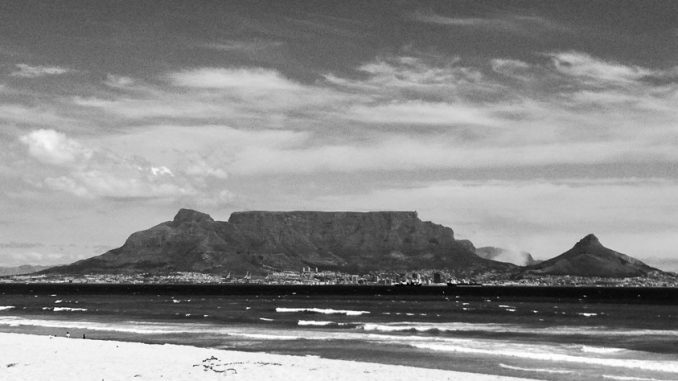 There are several scrambles and rock climbs up the North-East side of Table Mountain, known as the Saddle area. We chose the easiest and most popular of the lot, the Ledges Route. “Ledges” tops-out by a stream below the wetlands of the Eastern Table. 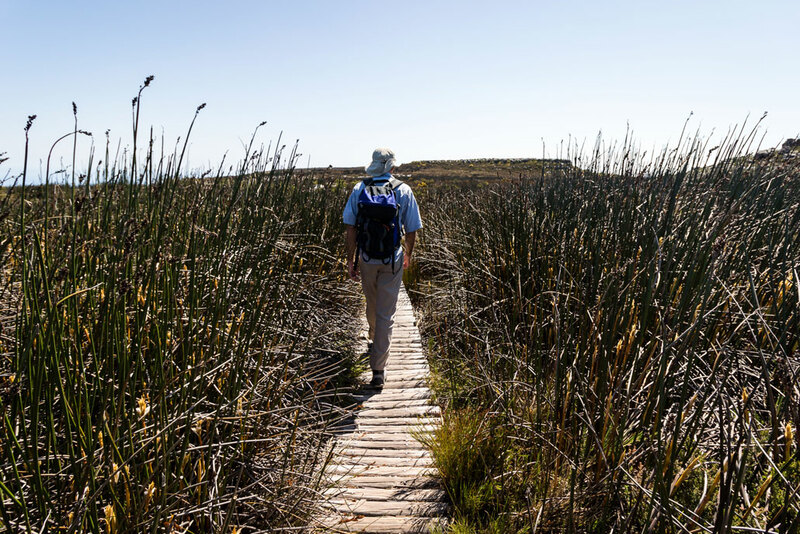 Care needs to be taken to stay on the path, as this area can easily be damaged by careless off-trail walking. 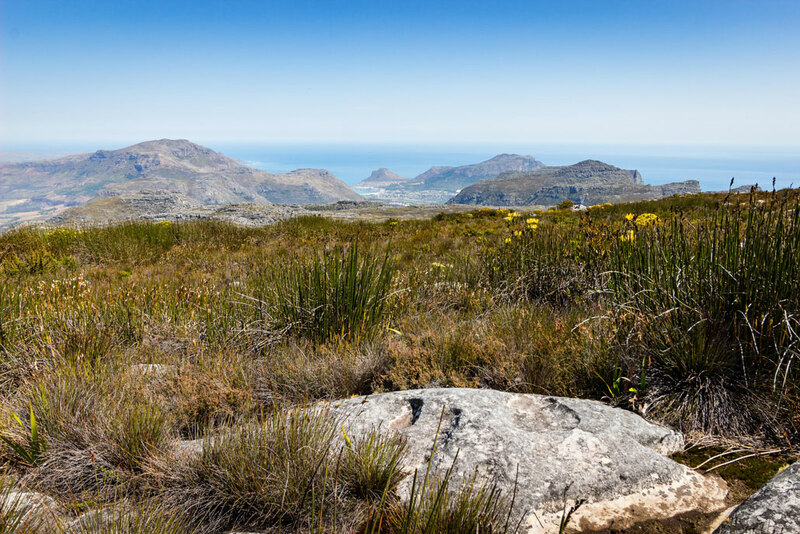 Looking back over the mountain, towards Hout Bay. 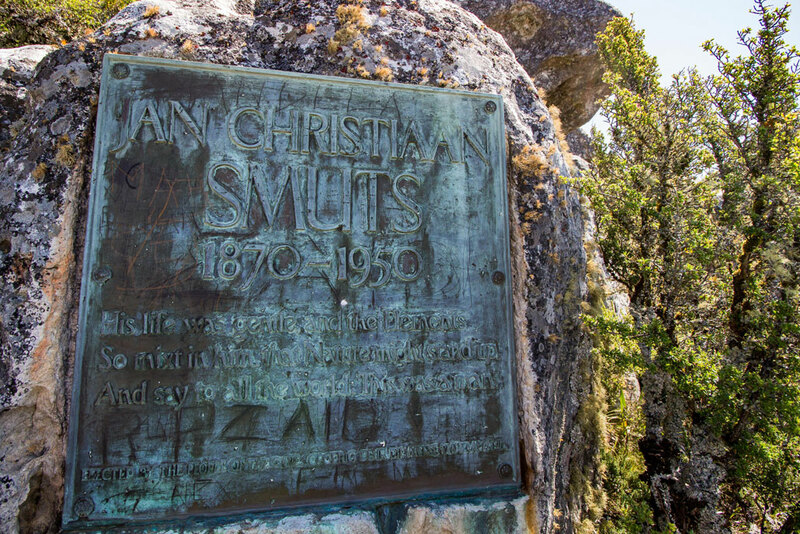 A commemorative plaque in honour of Jan Smuts, after whom the Smuts Track is named, which runs from Kirstenbosch, up Skeleton Gorge, to Maclear’s Beacon. 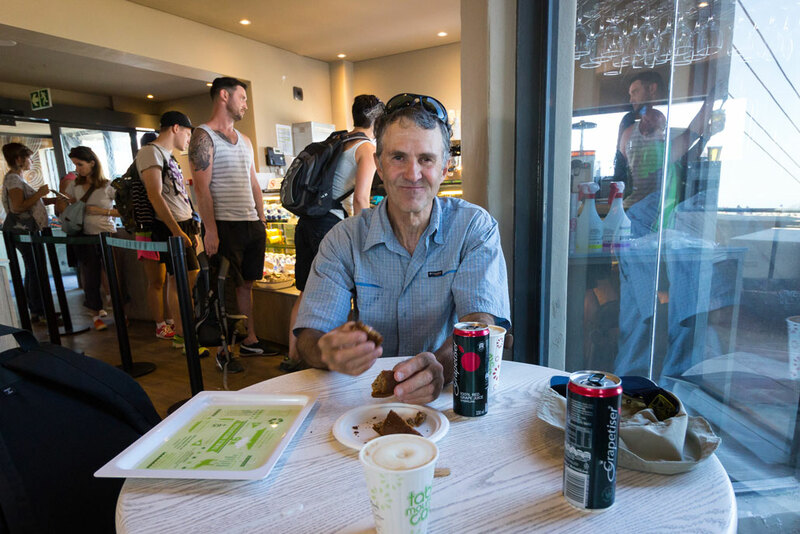 We made use of the air-conditioned luxury of the Wifi Lounge in the upper cable station building and enjoyed a cappuccino and some banana bread to help revitalise our tiring legs (and minds). As the saying goes, what goes up, must come down. 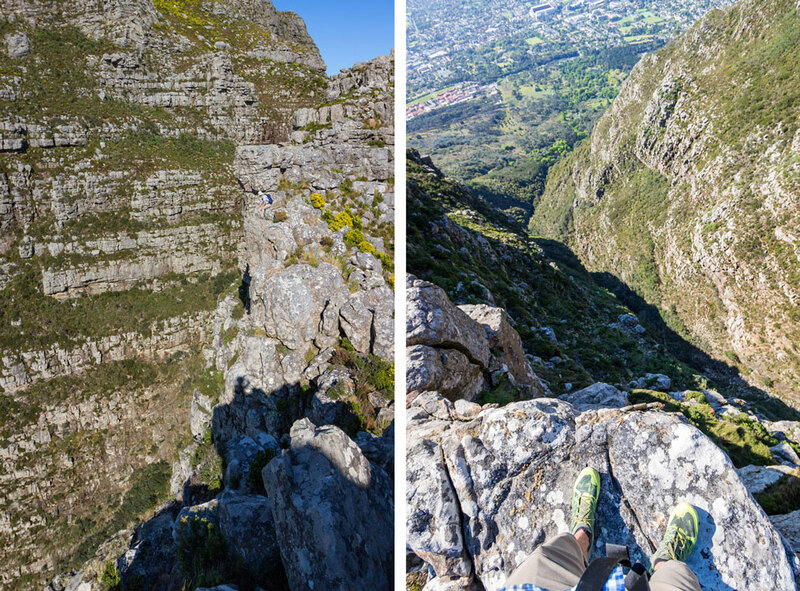 In our attempt to stick as close as possible to the Cape Town skyline, we abseiled down the 100m of sheer rock below the upper cable station. 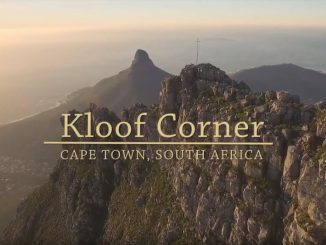 This put us at the top of Kloof Corner Ridge which runs all the way down to Kloof Nek and the start of the path up Lion’s Head. 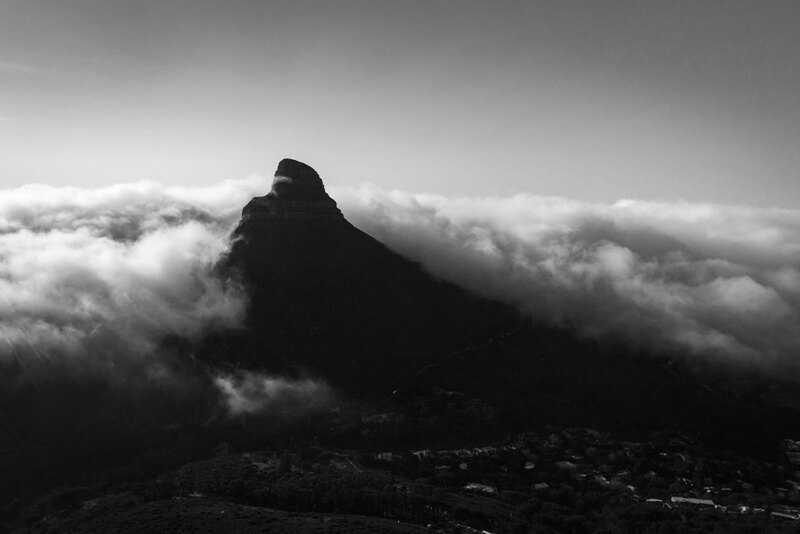 There was some rain predicted for the next day and the clouds put on quite a show as they rolled into Cape Town, enveloping Lion’s Head and swirling in the late afternoon light. 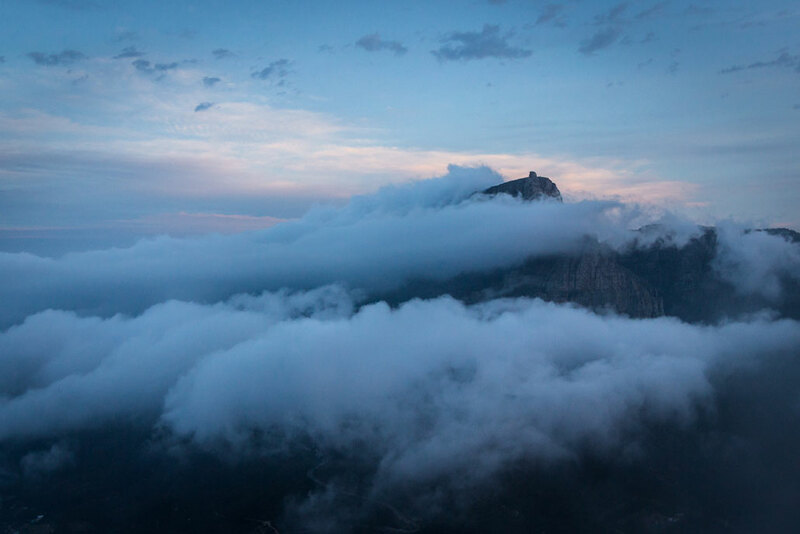 The upper cable station sticking out above the clouds. 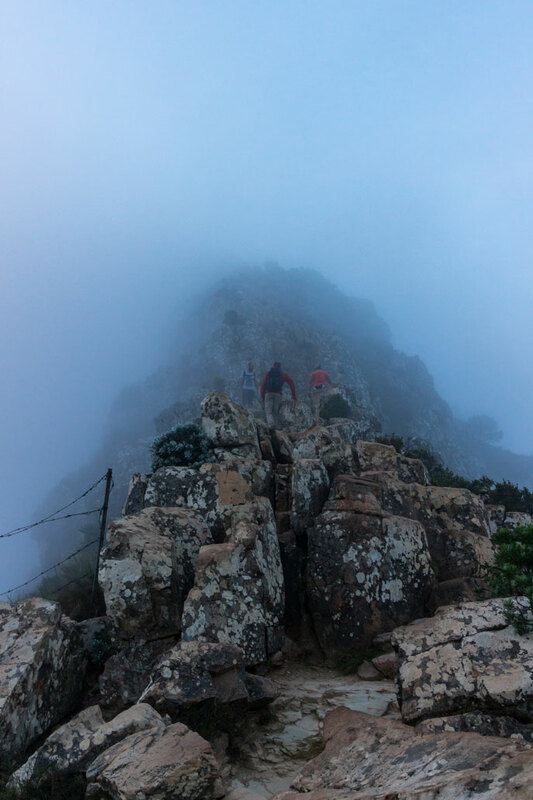 Heading up a cloud-covered Lion’s Head was quite atmospheric. From the summit, we had to carefully pick our way down a slightly wet and very windy mountain. The sun had set and we were losing daylight fast. Two abseils got us down to the slopes just above the standard circular path. From here, we followed our noses down the mountain in the dark, past the granite outcrops, until we reached the aptly named Top Road at the top of Bantry Bay. 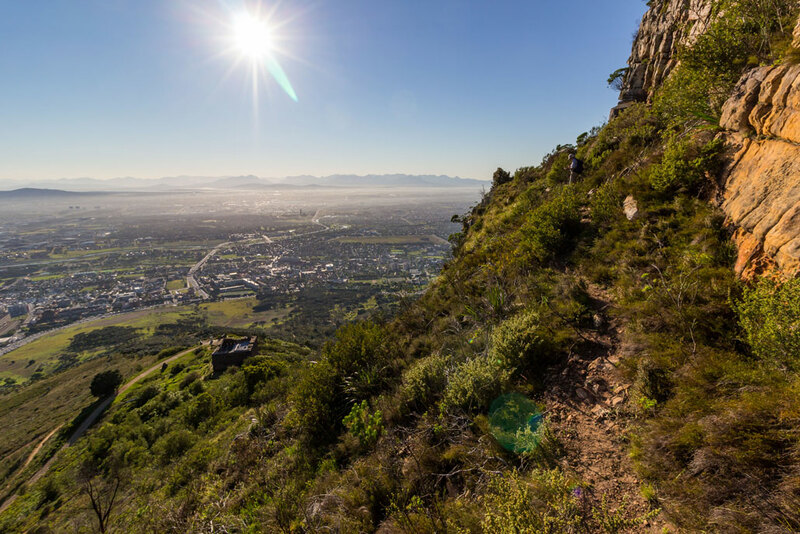 We skirted around the residential area until we reached Avenue St Leon and on to Bantry Steps which lead us all the way down to Victoria Road and the end of the Cape Town Skyline Traverse. Tired, happy and out of focus. An absolute 5-star mountain route with serious scrambles, magnificent views, airy abseils and the most iconic route profile. The #Relive video indicates a “moving time” of 5:26. 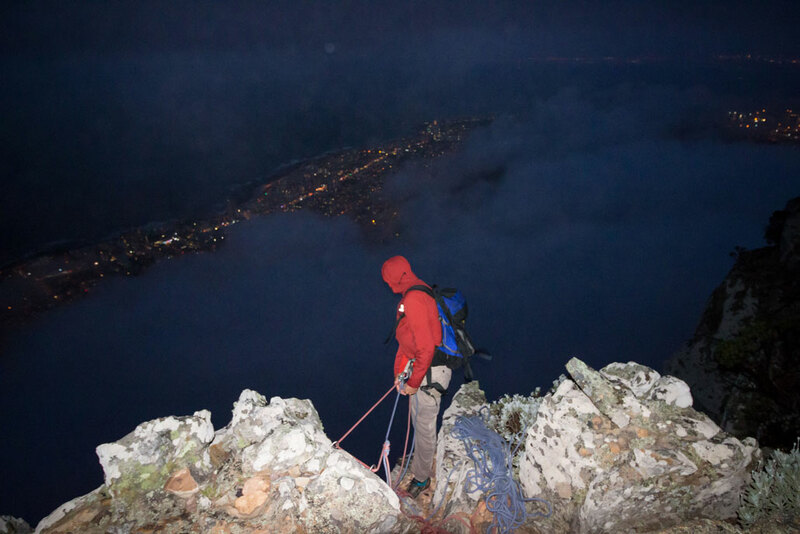 Our total time was 14 hours, which had us abseiling down Lion’s Head in the dark. It can definitely be done faster though. 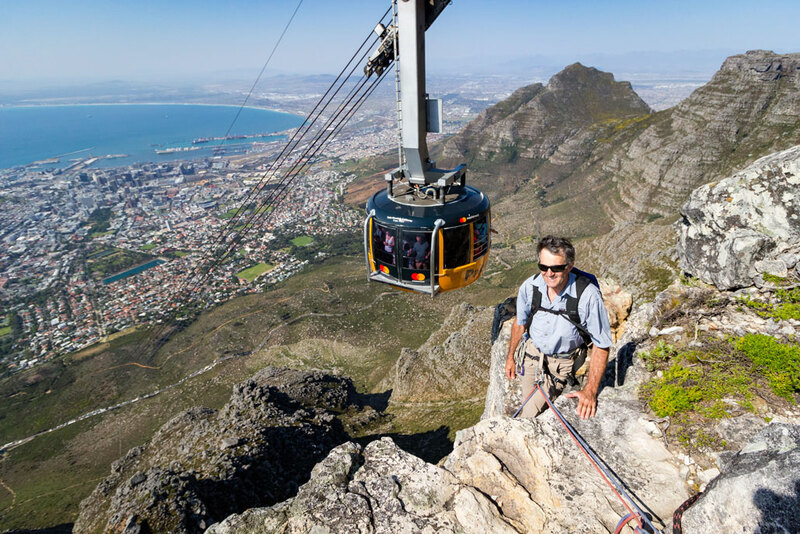 For some more interesting, non-hiking activities around Cape Town and the rest of South Africa, check out Jen Miller’s “100 Best Things to do in South Africa“. Awesome writeup, thanks for sharing!